Italy is filled with beautiful cities, with the likes of Rome, Milan, Venice, and Naples standing out as a few key examples. Another amazing, awe-inspiring Italian city is undoubtedly Florence. Known in Italian as Firenze, this city is the capital of the Tuscany region, which is well-known for its amazing hills, valleys, scenery, and history. With a population of over 380,000 people and more than 1.5 million in the full metropolitan area, Florence is the most populous city in Tuscany and one of the bigger cities of Italy too. It has an extremely interesting past, having been a major trade and financial center during periods like the Renaissance. In fact, Florence is regarded as the birthplace of the Renaissance period and was the birthplace of leading artists and Italian cultural icons like Dante Alighieri. The city continues to lead the way in fields of art, fashion, and culture, attracting millions of tourists each year from all over the globe. Its Historic Center is classed as a UNESCO World Heritage Site, and the whole city is simply filled with gardens, historical buildings, extraordinary architecture, incredible artworks, and amazing monuments to see and admire. If you're planning a trip to one of Italy's most beautiful cities to see landmarks and locations like the Ponte Vecchio, the Uffizi Gallery, and the Cathedral of Santa Maria del Fiore, you might be interested in staying in one of the city's hostels. 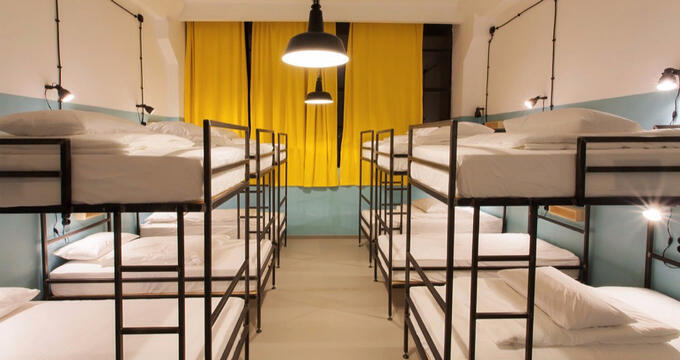 There are several highly rated hostels to be found in and around hostels, all offering affordable accommodation and access to the city's key landmarks. Read on to learn all about a few of the best hostels in Florence and start planning your Tuscan getaway today. Perfectly located near the center of the city, the WoW Florence Hostel is less than 10 minutes from the amazing Galleria dell'Accademia museum and gallery, with other landmarks like the Florence Cathedral and the Uffizi Gallery also within walking distance. Guests at this Florence hostel will also discover that the local area is filled with beautiful old buildings, with some very highly rated bars and restaurants nearby too. The WoW Florence Hostel provides both shared dorms and private rooms, so if you want a little more intimacy then you can elect to have a private room, but if you don't mind sharing, the dorms are available too. All rooms and dorms are very clean and decorated with bright, bold colors like reds, purples, and blues. You'll find a gym on-site with some fitness machines and equipment, as well as a dining area with tea and coffee-making facilities. There's also a rooftop terrace where you can hang out with your friends and admire the surrounding views of the Florence cityscape. If location is a big factor for you when choosing a hostel, the Santa Monaca Hostel of Florence might be exactly what you need. Amazingly located right by the Arno River, this hostel is just perfect for people who want to walk along the riverside and admire the various historic bridges and riverfront buildings of the city. Various churches and cathedrals can be spotted all around, with many major landmarks within walking distance like the Piazza della Repubblica, the Cathedral of Santa Maria del Fiore, the National Museum del Bargello, the Uffizi Gallery, and the Ponte Vecchio. You'll also find good transport links close to the Santa Monaca Hostel, with the Santa Maria Novella train station less than 10 minutes away. The hostel is housed inside an old building that dates all the way back to the 1400s, so it's a very exciting and interesting place to stay for people who really want to experience the history and heritage of Florence all around them. There are both private small rooms and spacious dorms with bunk beds and single beds at this location, as well as clean shared bathrooms. Free Wi-Fi is provided for all guests along with storage lockers and the use of a communal kitchen. If you take a look at online reviews from past guests, you'll see that people have a lot of very good things to say about the Hostel Archi Rossi. In fact, it's ranked as one of the best hostels in all of Florence, and it's easy to see why. Firstly, the location of this hostel is ideal. It's within walking distance of the Galleria dell-Accademia, the Basilica di San Lorenzo, the Florence Cathedral, and the Basilica di Santa Maria Novella, so you can see all of the city's big sites without even needing to use a bus or taxi. Not only that, but this hostel also excels in terms of comfort, cleanliness, and amenities. It offers free breakfasts in the mornings for each and every guest, with a selection of hot drinks and continental snacks provided to get you started for the day, along with free Wi-Fi access at all times too, so you can stay up to date and in touch with your friends and family whenever you need to. You'll also be able to enjoy a nice outdoor courtyard and games area at this hostel, with plenty of chairs and tables dotted around to let you sit back, relax, and simply let time go by.